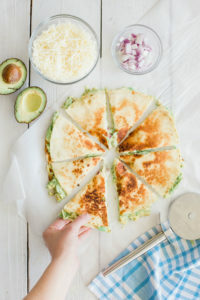 This Avocado Quesadilla is a great quick and easy lunch option for busy moms! 1. Heat large skillet to medium-high. 2. Spread Brummel and Brown on one side of each tortilla. 3. Sprinkle cheese on one tortilla. Add mashed avocado to the other tortilla and sprinkle with diced onion. Cook each side in the skillet until cheese is melted and each side is crisp and golden brown. Cut and serve.